Leveraging the Virtual Learning Environment to Support Indigenous Learners: Ready, Set, Go! 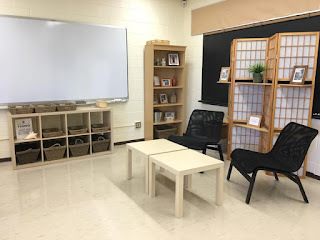 I wanted to create a classroom that would provide students with a choice in what kind of learning space works best for them. I also wanted them to be able to work collaboratively, communicate, and engage in critical thinking. 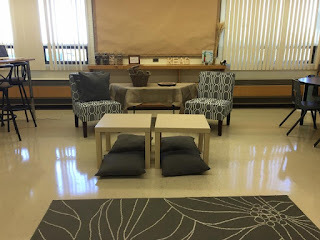 I tried to provide a variety of seating options. I have used chairs, yoga mats, pillows, exercise balls, stools, and a carpet. I noticed that my teacher desk took up a lot of space in the classroom. 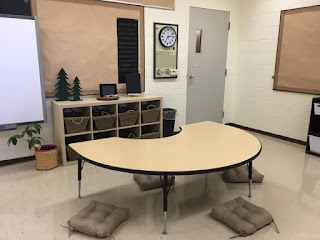 Therefore, I removed my desk and set up a teacher workspace in the back corner of the classroom. 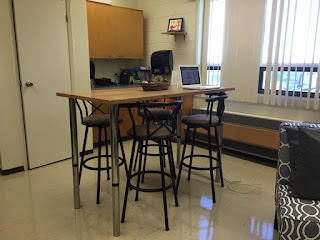 It allowed me to move the furniture around and provided more space for students to work. 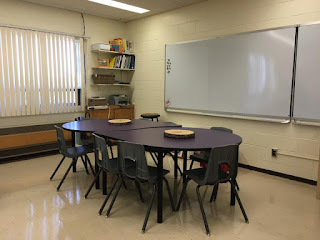 The tables in my classrom are big, round or rectangular, to encourage collaborative work. They also come in different heights - some allow students to stand, others are traditional height, and some are low to the floor. It is likely that the classroom space will evolve as I get to know the students and their individual learning needs.